Here at The Reader, we’ve been helping to bring about social change for over 10 years by sharing great literature, making it possible for people of all ages, backgrounds and abilities to engage with reading, improve well-being and build community. Through our Shared Reading projects, where prose and poetry is read aloud in small, regular groups, we put great literature into the hands of those who need it most. We read with some of the most vulnerable members of society in schools and nurseries, prisons and hostels, on hospital wards, in care homes, day centres, and in libraries across the UK. Shared Reading enables people to make personal and social connections through literature, providing opportunities for self-reflection, building social networks and improving the confidence, health and well-being of group members. The Reader is an independent charity, working in partnership with local health, education and social care authorities across the UK as well as with local library services, community organisations and the criminal justice sector. If you’d like to support the work of The Reader by making a one-off donation or by setting up a regular monthly donation, you can do so safely and securely over on our Virgin Money Giving page or by sending a cheque to The Reader, Calderstones Mansion House, Calderstones Park, Liverpool L18 3JB. All our volunteers receive full training and ongoing support, joining our national network of volunteers. If you’re interested in running a regular Shared Reading group in any of the above areas feel free to get in touch with the relevant contact. We’re also recruiting Reading Heroes in Wirral to read one-to-one with Looked After Children. If you love reading and can commit to at least six months reading with a child on a weekly basis you can contact Laragh for more information by emailing laraghgillen@thereader.org.uk or by calling 07970247483. Our Shared Reading groups are open to everyone and they’re all entirely free. 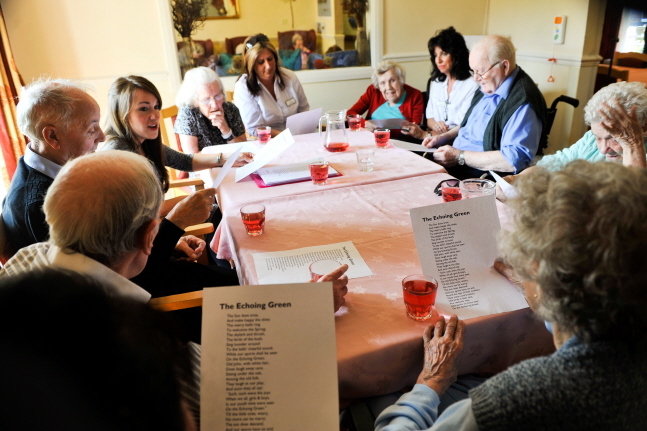 Groups meet regularly to read together, talk and share their thoughts on the stories and poems read. All the groups are led by a trained Reader Leader so there’s no pressure on group members to read aloud or even talk if they’d prefer not to. If you’d like to discover great literature, meet new people or just enjoy some time out to relax over a cup of tea, some biscuits and a good story, find a Shared Reading group near you on our Reader map. Perhaps you’d prefer to lead a Shared Reading group? We run a variety of regular training programmes throughout the year for individuals, volunteers and staff of partner organisations who are interested in becoming Reader Leaders and bringing Shared Reading into their own businesses or communities. There are currently two Masterclass courses coming up in Liverpool and London. If you’re interested in signing up, full details are available on our website. Also, for literature lovers on Merseyside, you can sign up for one of our Short Coursers for Serious Readers with Brian Nellist. The next course at Birkenhead Central Library will look into journeys and pilgrimages throughout literature, running 10.30 to 12.30 on Mondays from September 26 to November 28. If you’d like more information, please contact Lisa Spurgin by emailing learning@thereader.org.uk. You’ll get all the information on our upcoming courses and masterclasses by following us on twitter or signing up to our newsletter. Help us spread the word about Shared Reading so we can reach as many people as possible. If you know someone who loves literature and wants to meet new people why not tell them about our groups? Maybe you have a neighbour looking for the perfect volunteering opportunity? Perhaps your employer is interested in training that will offer mental health and well-being support to your team? Or maybe the next person you meet at the bus stop will be a huge poetry-lover. If Shared Reading has taught us anything over the past ten years it’s that wonderful things can happen when people start talking, so tell your friends and family, follow us on Facebook or retweet our literary gems on Twitter. At The Reader we’re all about making connections – you could be part of that with just the little click of a button.